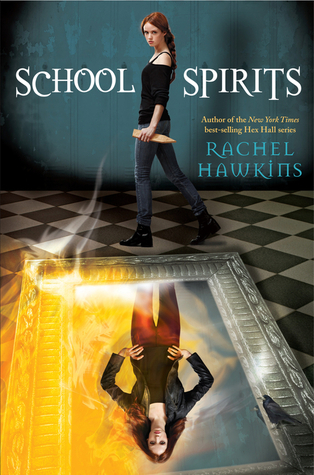 School Spirits by Rachel Hawkins is the first book in the series of the same name, which is a spin-off of her Hex Hall series. Fifteen-year-old Izzy Brannick was trained to fight monsters. For centuries, her family has hunted magical creatures. But when Izzy's older sister vanishes without a trace while on a job, Izzy's mom decides they need to take a break. Izzy and her mom move to a new town, but they soon discover it's not as normal as it appears. A series of hauntings has been plaguing the local high school, and Izzy is determined to prove her worth and investigate. But assuming the guise of an average teenager is easier said than done. For a tough girl who's always been on her own, it's strange to suddenly make friends and maybe even have a crush. Can Izzy trust her new friends to help fins the secret behind the hauntings before more people get hurt? 1. As a fan of Hawkins' Hex Hall series, of course I wanted to read this book, especially since Izzy was my favorite of the Brannick's. Plus the Brannick's are a little like the female version of the Winchesters, minus the Impala. While I liked this book, I just didn't think it was quite as good as the Hex Hall books. 2. I find Izzy's awkwardness simply enduring. As tough as she is at fighting monsters, she has no clue on how to navigate high school, but that makes me like her even more. 3. How awesome is Dex? He has his own sense of style and doesn't let popular opinion change him. He is also quite the gentleman. 4. Hawkins definitely left lots of lingering questions at the end of this book, and it will interesting to see where she takes the series. Plus to see how Izzy and Dex relationship plays out, and if Torin will be a factor in it. 5. Speaking of Torin, I like the cheeky warlock trapped in the mirror. He is 400+ years old but still enjoys watching teen soaps with Izzy. I think he knows more about Finley than he is letting on, and might have feelings for Izzy.